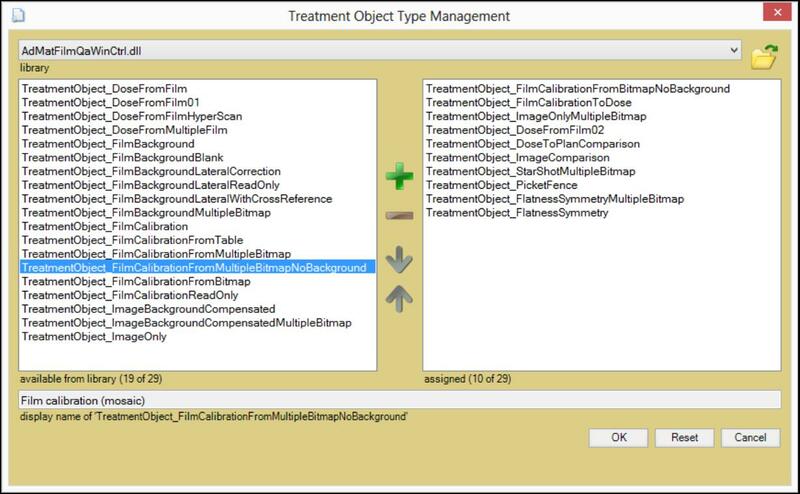 The selection list at ‘Case object management’ → ‘Add new case object’ as shown below includes all currently installed Treatment Object Types. By default FlimQA pro only lists the most commonly used types. There are additional Treatment Object Types available. FilmQA Pro will automatically look up types required to open a case file (e.g. case that uses obsolete treatment object type). The management of Treatment Object Types can be accessed via menu bar as shown below. 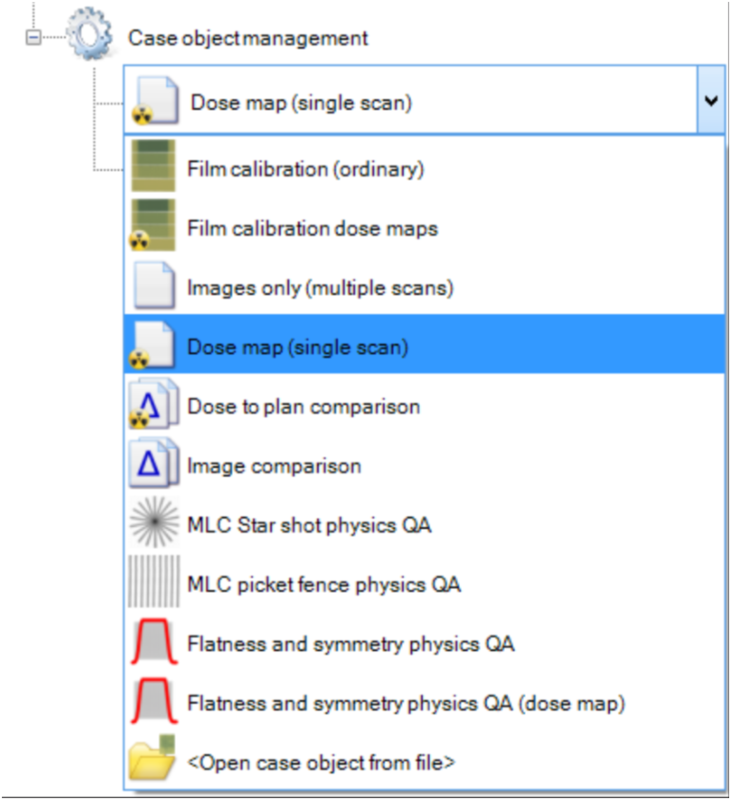 Reset to default treatment object types: Assigns the FilmQA pro default list of most commonly used treatment object types. Always include default treatment object types: Flag indicating whether the default treatment object types are enforced to be on the list. Add new treatment object types of read case: When enabled, any treatment object type used is a read case file is automatically added to the list of available types. 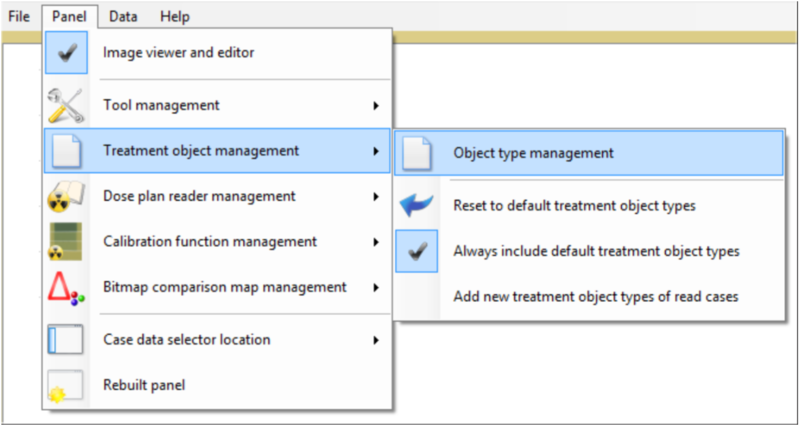 Object type management: Opens dialog as shown below to add, remove or edit treatment object types. Right table includes the currenly assign treatment object types. The left table shows the available but not yet assigned treatment object types. To install new type select a type in the left table and use the button to add it to right table. To uninstall select a type in the right table and use the button to remove it from the list. 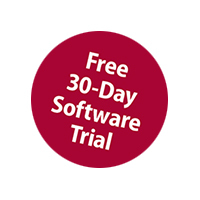 Use the two arrow buttons to change position of installed types in the right list. Press the ‘OK’ to finalize the changed made. 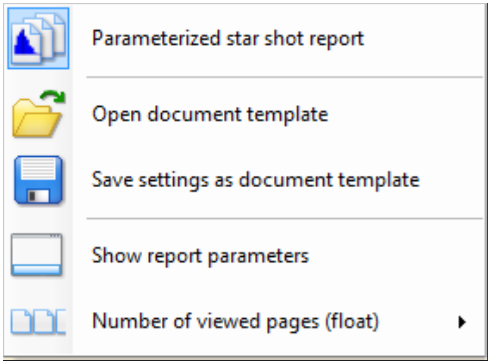 One can save the settings using the button underneath the ‘Case data selector’ as shown below.